Looking for the best family cruise? Let me help you find the cruise lines and ships that fit your budget and lifestyle. If you have never cruised before, you might think that only Disney Cruises offer cruises for kids. Not So! In my opinion, Disney cruises are too expensive, and yet they are fully booked way in advance. And I think it's mostly because of what is perceived as the "kids Cruise Line". We have never been and haven't missed anything. My daughter and thousands of other kids of all ages have enjoyed other cruise lines tremendously. Of course you always want to do your research before booking a cruise. I was able to find some good deals because I took the time to compare ships, cabins, prices, etc. Use my system to search through many travel sites at once and find cheap cruises and all inclusive family packages. Carnival Cruise Lines with a fleet of "fun ships", has Camp Carnival with scheduled onboard programs for ages 2 through 14, special shore excursions for teens, and baby sitting for a fee. Your kids of all ages will enjoy the newest and big ships. Visit the "Funship Island" and get a virtual tour. Celebrity's X-Club Youth Program offers activities for kids ages 3-17. Children can learn by exploring science and nature or just have fun from talent shows to slumber parties. Celebrity offers in-room babysitting for a fee. This cruise line is a bit more upscale and therefore more expensive. You might want to do a search, using Kayak in the right column. Disney Cruises of course have the Disney characters to entertain the kids on the ships, as well as many family activities. The ships are floating theme parks. The ships have supervised children's programs for ages 3 through teens. Expensive and you have to book well in advance. For more Disney Cruise Line information check out Magical-Cruise-Ships.com. NCL's (Norvegian Cruise Line) Kid's Crew program has a playroom staffed with youth coordinators and activities scheduled for kids ages 2-17. Fun things to do for kids include dancing, arts and crafts, treasure hunts, costume-making, and games. This was my daughter's favorite cruise line growing up. Very informal, priced right and offering any time dining, no assigned seating in any of the dining rooms. Princess Cruise Line offers a program that provides age-specific activities for kids 3-17 including games, treasure hunts as well as learning activities on science, wildlife, and conservation. Teens will enjoy Nintendo, movies, Karaoke, and giant screen TVs. Princess also has group babysitting. Beautiful ships, great food. Usually more expensive than NCL or Carnival. 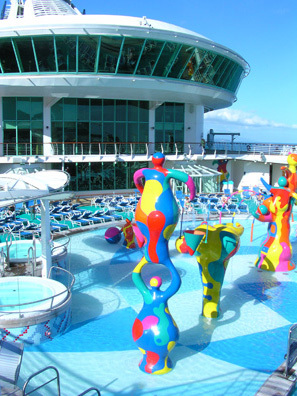 Royal Caribbean International has big ships with non-stop activities for children. Famous for their rock-climbing walls and ice skating rinks, Royal also has the supervised youth program, Adventure Ocean, targeting kids 3 to 17 in five age groups. Group babysitting is also available. If you have teenagers, you would probably be wise to choose RCL for the best family cruise. Teenagers love RCL because they do have activities 'out of the ordinary'. Who would have thought you could go iceskating on a cruise ship while sailing the Caribbean... and what about the 'surfing pool' on the Freedom of the Seas? Looking for family reunion ideas? Go on a cruise!